What do the Spokane River and a Boeing 777 have in common? A lot of toxic pollution, and that’s not a joke. Washington Governor Jay Inslee just announced a special legislative session (starting Thursday, November 7) with the goal of keeping Boeing’s 777X airplane manufacturing business in Washington. The governor wants a special package that will persuade Boeing from moving on to a friendlier tax and transportation state.Some of the package makes sense. Investment in infrastructure to reduce Puget Sound freeway gridlock, workforce education, and tax incentives all connect to the goal. But the package also includes a “human health and water quality” element that will undermine proposed updates to water quality laws that are supposed to protect the health of the many Washingtonians who eat fish. Notwithstanding the bureaucratese, the message is clear: clean rivers are not as important as jobs. Unfortunately, this formulation does not account for the benefits of clean water to the economy, and the costs to public health of toxic rivers. The problem in a nutshell: Washington’s water quality laws are based on calculations of how much fish is safe to eat from polluted waters. Many state rivers are polluted to the point that fish consumption is unhealthy. 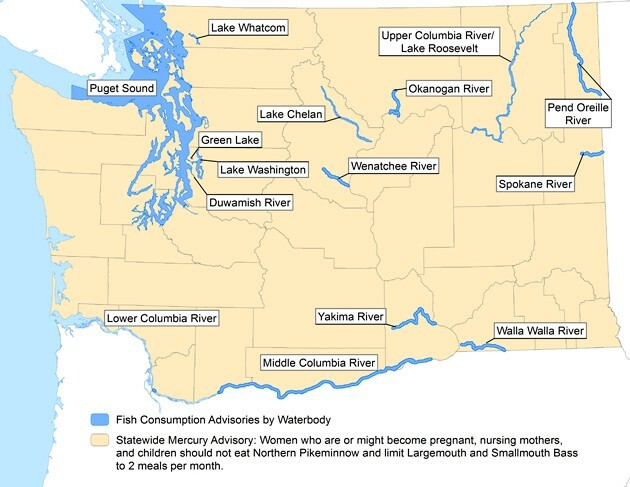 For example, people who eat fish from the Columbia River and its tributaries (once home to some of the most abundant fisheries on earth) are now reading public health advisories posted at their long-time fishing spots. The more fish you eat, the greater your toxic exposure. This affects a lot of people in Washington, including Native Americans (who have dietary traditions going back thousands of years), along with a lot of non-tribal citizens who appreciate the abundance of our fresh and marine waters. But, contrary to practical knowledge, the current standards assume people eat only 6.5 grams of fish per day, or about 8 ounces per month. Given the inaccurate baseline for fish consumption quantities, the Department of Ecology began to update the standards a few years ago. But along the way, Boeing, Inland Empire Paper (in Spokane) and other polluting industries demanded that Ecology slow or halt the revision process. It is true that updated standards would impose stricter limits on the amount of pollution these industries are allowed to pipe into state rivers. It is also a fact that the new standards would be based on what is needed to protect public health. State efforts to dodge accountability are impressive. Ecology convened a “stacked deck” advisory group, but environmental groups and Tribes boycotted. Boeing went to the governor’s office, and got the delay it wanted. Legislative skirmishes ensued in 2012 and 2013. Public interest law firm Earthjustice filed suit on October 11, challenging the U.S. Environmental Protection Agency’s failure to step in when Washington failed to adopt standards that protect public health. Ecology’s public information meetings continue to whitewash the problem. If and when Ecology does adopt standards that protect public health, it has announced it will also adopt various loopholes that could allow polluters to delay compliance for decades. At his press briefing, Gov. Inslee indicated that there would be no legislation on this issue, raising concerns that a backroom deal may have been struck. Why does Boeing care about fish consumption rates to the point that this is part of Governor Inslee’s package? According to Ecology’s permit website, Boeing holds more than a dozen pollution permits for its industrial facilities in Everett, Renton and Auburn. These permits allow the company to discharge polluted stormwater into Puget Sound and air pollutants that inevitably return to earth. Link here to view Boeing’s water pollution permits (type “Boeing” into the “Facility/Project” tab, then click on “search”). And here for air pollution permits. Apparently, airplane manufacturing causes a lot of pollution. When it rains, that pollution runs off of Boeing’s industrial tarmacs and into Washington state waterways. So far, it’s “my way or the skyway” with Boeing planes pitted against clean water and healthy fish. Unfortunately, I can’t serve a 777X at my dinner table. Categories: Water Pollution | Permalink. industrial polution? It comes down to what do we value most? – our health or industrial waste in our water because of job creation?